Solvent Base AdhesiveNon-sag, 735D - PERMA ENTERPRISE CO., LTD.
Non-sag. Usable under water. Flexible. Resists temp. from -60 to +120 . 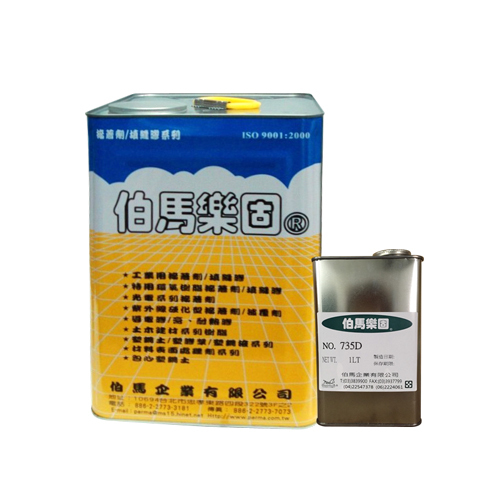 Various viscosity are available. For sealing / bonding / leakage prevention / repairing of electronic parts and structures, leakage prevention/repairing under water. Dear Sir/Madam, I’m interested in Solvent Base AdhesiveNon-sag, 735D that your company provides. Would you kindly contact me with your detailed product information and FOB price? Thanks.